Our church is promoting not just Giving Up, but Giving Back for Lent, so they are offering a chance to serve the under-resourced each day in various places for 30 days all throughout Atlanta. Carla, my adventure friend in Atlanta, and I decided to serve at Georgia Avenue Church’s food co-op. We arrived at the church, not knowing what to expect. When we arrived, Brian, one of the staff members, told how this church serves 250 families per month and brings in groceries from the Atlanta food bank. They only have to pay $3 to get about $80-90 worth of groceries. A truck arrived carrying one ton of food that would serve 50 families. So, we began to unpack the truck and sort the groceries with some of the co-op members. After the food sorting was done, they read scripture from Ecclesiastes 3, sang “I Am Somebody,” and prayed with passion – thanksgiving for the food, for those that came to help, the sick, the mayor, the government, etc. I was in tears. It was without a doubt a church service made just for me! As I left, I thought about the food and what had taken place. Part of my story is that I don’t have a good relationship with food. I was teased as a child for being overweight, and as a child and young adult, I was on every kind of diet that had been developed. I realized that food has been an enemy of sorts. I also realized that I have never needed for food. It was in plenty as I grew up and in plenty throughout my life. I have always had it in abundance, very much in contrast to the people we were serving. On this day, I realized that food is a gift and a necessity. It is not the enemy. Food provides energy to go to work and to nourish the little children that were running around at Georgia Avenue that day and their parents who raise them. As Brian from Georgia Avenue said, their co-op provides food for the “tummy and soul.” That day I walked in not knowing what to expect, ready to prepare food for others’ tummies and God ended up nourishing my soul. How has God nourished your soul lately? 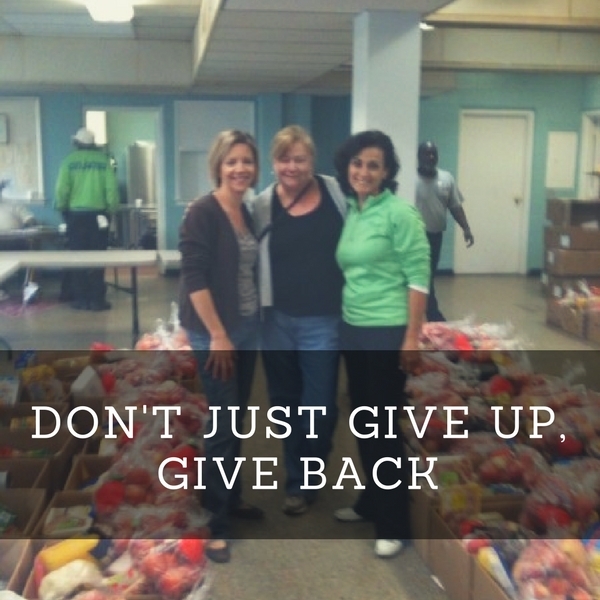 When have you helped the under-resourced and then been blessed in an unexpected way? What piece of your story do you need to reframe in a healthy way? How has God provided for you lately – body, mind and soul? 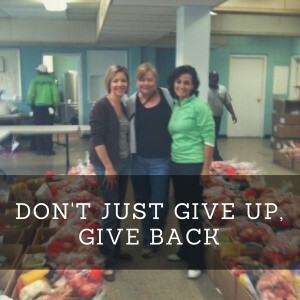 How is God calling you to give up and/or give back?